Taylored Cycles offers a Dr Bike service. We come to your business or organisation to repair the bikes of your staff. You can arrange for us to come for a whole day or a half day. We will set up a workshop at any site that suits you, such as in a car park or foyer. The organisation or business, can pay for a Dr Bike; or you can simply make the arrangements for our visit and your employees can pay individually. The best way for payment is by invoice either for our time only and the bicycle owners can pay for any parts needed, or we can invoice for everything if you want the bicycle owners to get really looked after. We can accept payment for parts on the day by cash only. 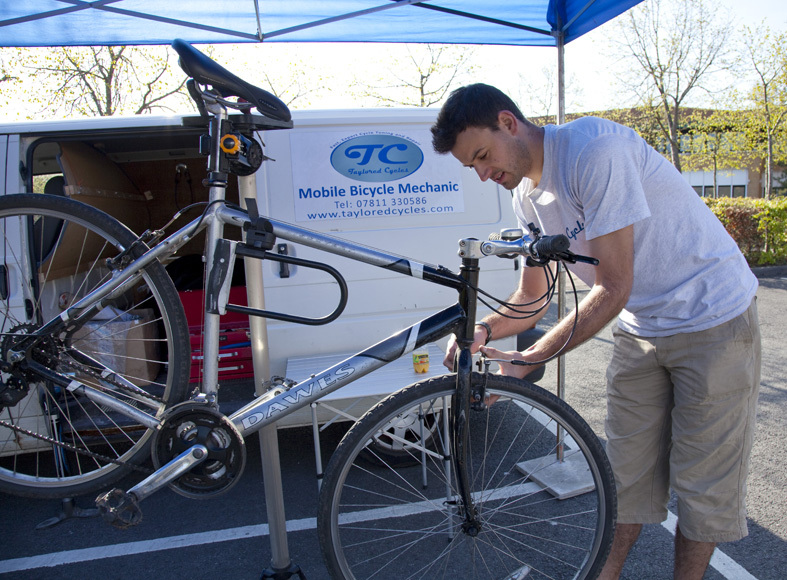 We’ve found that arranging to see a bike every half an hour is a good balance between; giving each bike a thorough check with attention paid to any ongoing problems and providing good feedback to the bicycle owner, and getting a many bikes seen as possible. Taylored Cycles has run very successful Dr Bike days at schools, charities, international corporations, council buildings and multi-organisation occupant buildings. We have run events all over Bristol and as far afield as Swindon and Reading. We have ongoing repeat contracts with Bristol City Council, Bath and North East Somerset Council, University of Bristol and the University of the West of England. If anyone at your organisation needs more in depth work than we can do at a Dr Bike then point them to our We Come To You page for a more personal and in depth service.